Micromax Canvas Play (Q355) featuring Quad-core, Android 5.0 Lollipop,5.5 inch Display and 2820 mAh battery launched in India without pricing and availability details. 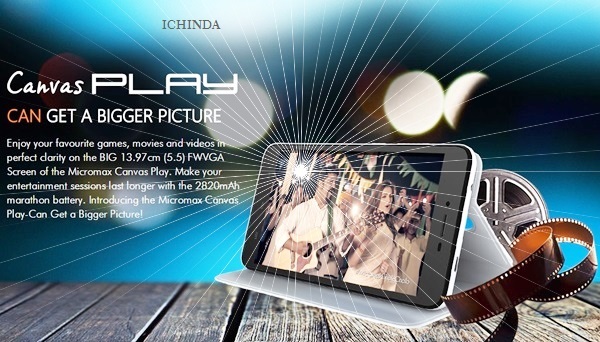 Micromax Canvas Play (Q355) will be available soon in Indian market priced Approx. Rs 3,999 in in Black colour option. Micromax recently confirmed that the all new Micomax Yu Yuphoria will be the successor of Micromax Yu Yureka which expected to launch in Q2 expected price Approx. Rs 9,999. The all new Micromax Canvas Play (Q355) supports Dual-SIM(GSM+GSM), Bluetooth 4.0, Wi-Fi, Micro-USB, GPS, GPRS/ EDGE, and 3G comes with a bigger 5.5-inch FWVGA display with resolution (480×854 pixels) and 16.7M Colour depth for crystal clear view perfect for watching movies, playing games and reading e-books. Micromax Canvas Play (Q355) runs on most advance Android 5.0 Lollipop OS and powered by 1.3GHz Quad-core MediaTek MT6582M processor with 1GB of RAM, 8GB Internal memory and 32GB expandable memory promising superior user interference and blazing multi-tasking. Micromax Canvas Play (Q355) also sporting a 5-MP rear Auto focus camera with LED flash for shooting and 0.3-MP front facing camera for selfies and video calling packed with a powerful 2820mAh battery promising standby time up to 273 hours and Talktime up to 10 hours including pre-loaded apps like Trending apps, Askme, Chaatz, Cleanmaster, Dr. Safety, Games Club, M! Games, M! live, News Hunt, Paytm, Quikr, Snapdeal, Reverie, Swiftkey and Giga jump. Micromax has recently launched all new Micromax Canvas Play (Q355) in India priced at Rs 4,999($79) which slated to go on flash sale from 29th April through Snapdeal White-Gold and Grey-Silver colour option. The all new Micromax Canvas Spark (Q380) supports Dual-SIM(GSM+GSM), Bluetooth 4.0, Wi-Fi, Micro-USB, GPS, GPRS/ EDGE, and 3G comes with a 4.7-inch qHD IPS display with resolution (540×960 pixels) and Corning Gorilla Glass 3 protection runs on most advance Android 5.0 Lollipop OS and powered by 1.3GHz Quad-core MediaTek MT6582M processor with 1GB of RAM, 8GB Internal memory and 32GB expandable memory sporting a 8-MP rear Auto focus camera with LED flash for shooting and 2-MP front facing camera for selfies and video calling packed with a powerful 2000mAh battery promising standby time up to 335 hours and Talktime up to 9 hours juts 8.5mm thick and weight 134gm and support for 21 languages. At last few Honest word Micromax Canvas Play (Q355) is coming to please the Indians. What you think? Please be open top give your view.